Son Heung-min of Tottenham Hotspur extended his scoring streak since his return to the team from Asian Cup duty in late January to four games with a goal against Borussia Dortmund during a Champions League match in London on Wednesday. 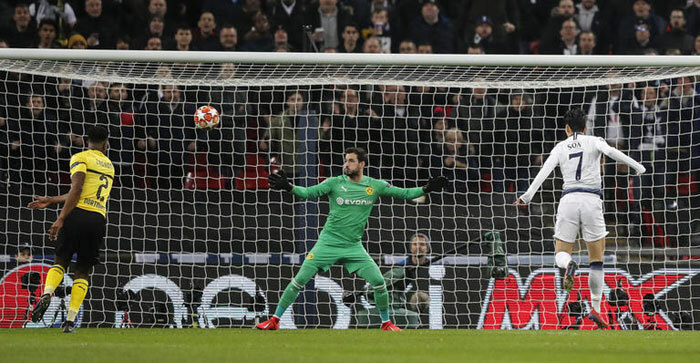 The first half of the first-leg, round-of-16 match at Wembley Stadium was scoreless as Dortmund put heavy pressure on Tottenham, but Son broke the deadlock just two minutes into the second half, striking the ball past goalkeeper Roman Bürki after collecting a perfect cross from Jan Vertonghen. Vertonghen and Fernando Llorente later scored for Spurs, giving the team a comfortable 3-0 win. Tottenham will face Dortmund again on March 6 in the German city for the second leg. Son has 16 goals and eight assists for Spurs in all competitions this season.